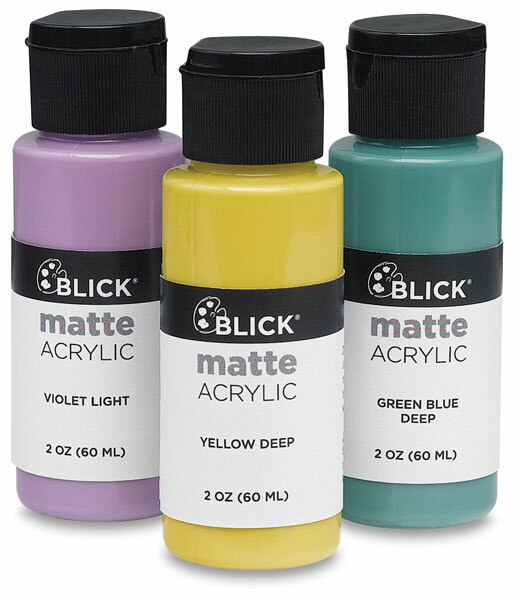 Blick’s opaque, matte-surface acrylics are water-based, quick-drying, and permanent, yet non-toxic and safe for everyday use. Formulated with the highest-quality pigments in an exceptional range of colors, they're extremely affordable. They pour readily and consistently, apply smoothly, cover well, and can be applied to almost any surface — including paper, wood, fabric, ceramic, glass, metal, and some plastics. Perfect for decorative painting and stenciling, Blick Matte Acrylics also blend extremely well, making them ideal for glazing, antiquing, and faux finish techniques. Use them on picture frames, furniture, home décor, or for personalizing children's crafts. Blick Matte Acrylics bring out the artist in every crafter! Basic Set — Contains 7 colors in 2 oz bottles, including one each of Red Deep, Yellow Medium, Blue Medium, Orange Medium, Green Deep, Violet Deep, and White. Pastel Set — Contains 7 colors in 2 oz bottles, including one each of Red Light, Yellow Light, Yellow Orange Light, Yellow Green Light, Green Blue Light, Blue Light, and Amethyst. Neutral Set — Contains 7 colors in 2 oz bottles, including one each of White, Off White, Celadon, Sage Blue, Brown, Silver Metallic, and Gold Metallic.